A host of Dublin Jerome defenders bring down Hayes’ Warren Clasen during the second half of Friday’s OCC showdown in Delaware. DELAWARE — There’s a railroad track that runs just West of the football stadium at Delaware Hayes High School. After a rough first half, the host Pacers may have wanted to jump on one of the many locomotives that rolled by during their annual homecoming game Friday against visiting Dublin Jerome. 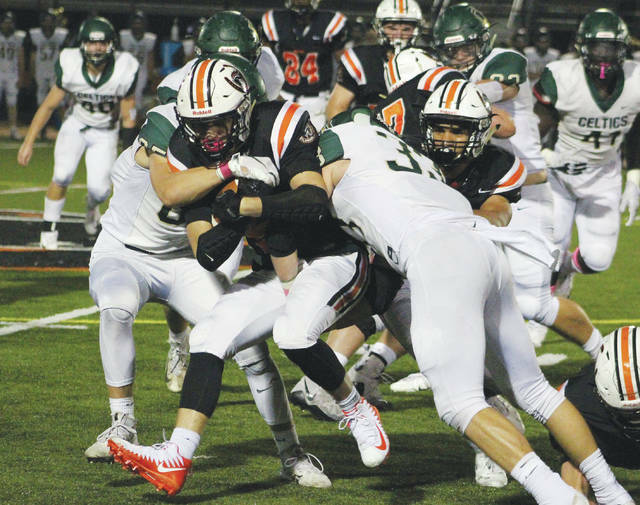 The Pacers missed out on a chance to improve their OHSAA state playoff standing as they were outplayed by the visiting Celtics in a 35-21 defeat. “We just had a bad second quarter,” Delaware coach Scott Wetzel said. “What could go wrong, went wrong. The visitors rode a big night from sophomore quarterback Ryan Miller. The signal-caller accounted for four first-half touchdowns as Jerome built a commanding halftime advantage. Delaware and its packed home crowd came to life in the second half as it scored twice in the third quarter. Warren Clasen scored on a 6-yard touchdown run midway through the third quarter, to make it 28-14. The Pacers (5-2) defense recovered a fumble and Delaware quarterback Blake Eiland orchestrated a drive that ended with him plunging into the end zone to bring the home team to within a score at 28-21. But, despite forcing two more second-half Jerome turnovers, the Pacers were unable to put any more points on the board. Jerome (3-4) tacked on a fourth-quarter touchdown to provide the final margin of victory. “I was proud of the way our kids battled back in the third quarter,” Wetzel said. “We’ve got things that we need to work on, but I think in the third quarter we proved that we’re fighters and a good football team. Miller scored on a pair of 1-yard touchdown plunges and then connected on a 5-yard scoring strike to Luke Martin. He closed the half with a 13-yard scoring scamper with just 19 seconds to go. The Pacers didn’t have a lot to cheer about in the first half. The team’s lone score was an impressive 7-yard run by standout running back Jahi Broussard-Nash. The junior broke a number of tackles and plowed his way into the end zone. Broussard-Nash left the game immediately after, though, limping off in pain and did not return. His absence was evident as the Pacers were unable to muster much of an attack without him out on the field. Delaware came into the game third in the Division I, Region 2 playoff rankings. Its margin of error in the final three games of the season is slim to none. The Pacers will return to the field Friday when it plays at Thomas Worthington.